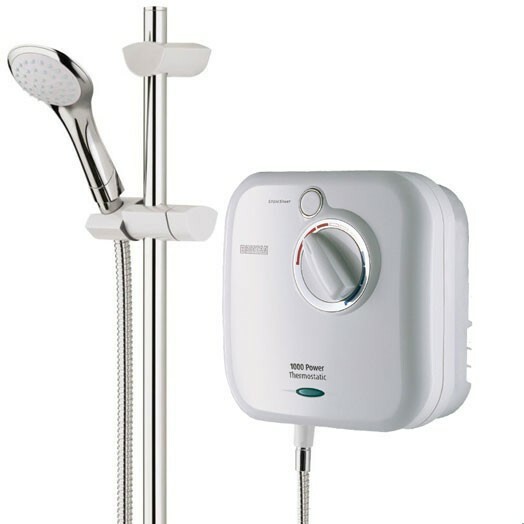 The NewTeam NT 1000 XT is an all-in-one integral shower that combines a mixing valve with a pump in one complete unit. The valve will blend your hot and cold gravity fed water supplies to achieve the showering temperature that you desire, whilst the pump boosts the flow of water to give a powerful, invigorating shower. This is a thermostatic model; the thermostatic valve maintaining an exact temperature, even if water is drawn off elsewhere in the home. 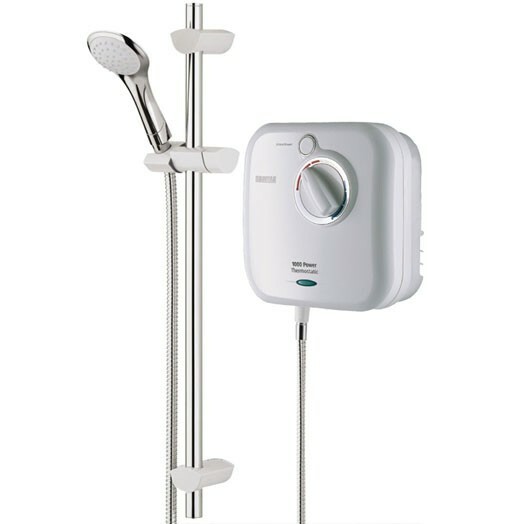 High flowing power shower that can deliver up to 10 litres per minute. Thermostatic control keeps water temperature within +-1 Degree C.
Simple push button Stop/Start control. Easy grip dial controls the temperature. Riser rail with smooth glide action slider for single handed adjustment. Side or concealed rear supply pipe entry along with push fit fittings, ensuring ease of installation (see fitting instructions below for exact entry points). Rub clean handset with three invigorating spray patterns - Spray, Massage and Combination spray. IMPORTANT: The Newteam and Showerforce Brand names are owned by Bristan, as part of their ongoing streamlining of operations all brands are being amalgamated under the Bristan banner. It is very likely that your new product will be boxed and badged as Bristan not Newteam or Showerforce. If you need any advice or help please call our helpline on 0843 658 0062. 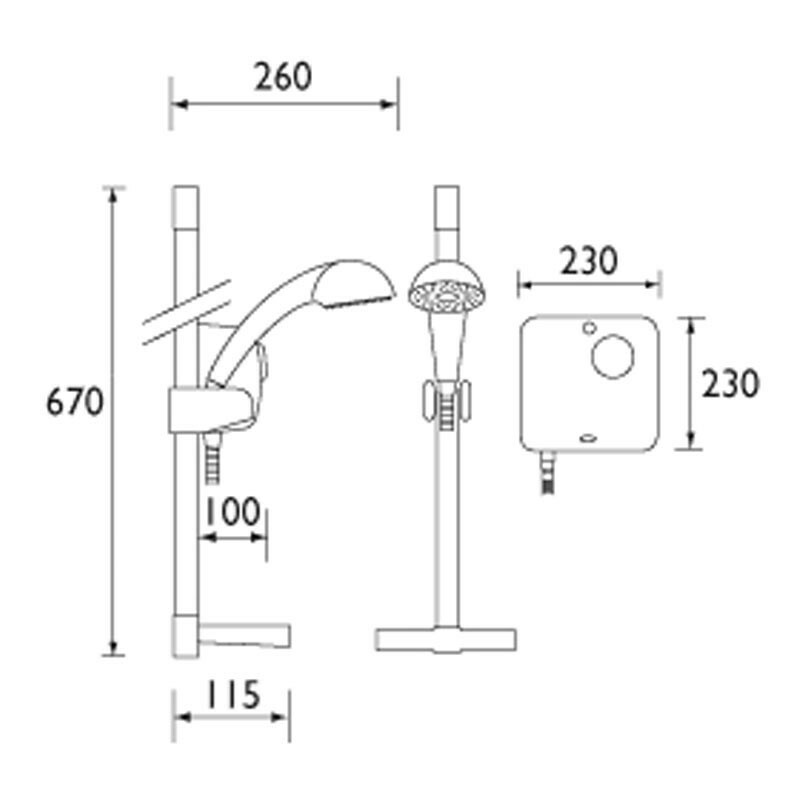 The only thing I would as about this shower is that the upright that you fix to the wall is different to the old model and the shower head itself sits too upright within this fixing. It makes for a very wet bathroom floor!!!! Product is excellent - looks neat and with the power on/off button you can leave the thermostat setting in one place. Only one slight issue - the unit is white and all images (on website and pacakging) show a white riser, but this was supplied in chrome. Not a problem for me beacuse we quite like the... Read More. Product is excellent - looks neat and with the power on/off button you can leave the thermostat setting in one place. Only one slight issue - the unit is white and all images (on website and pacakging) show a white riser, but this was supplied in chrome. Not a problem for me beacuse we quite like the chrome effect but is suppied differently to how it is shown. Good product. Good replacement for previous model. Obviously not one of the best in relation to cost but does exactly what it should. Extremely easy to use and easy to install too. It was a replacement of the same item and that was just what I needed Thank you so much for you custom and kind review.